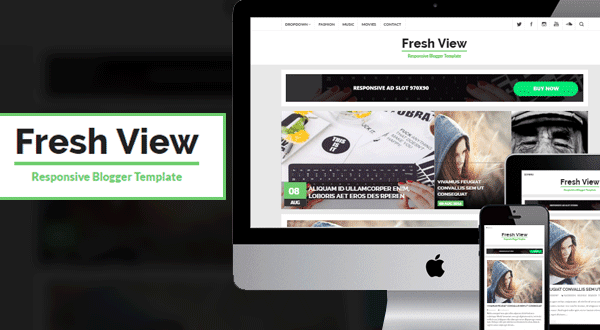 Fresh View is a another awesome template from MS Design BD. Fresh View is fully responsive and SEO optimized blogger template. You can use this template on your personal blog site. Fresh View Blogger template is perfect for any review or blog site. In this template we first time use a awesome social icons widget like, Facebook, Twitter, Pinterest, Instagram, Google Plus, Linkedin, Flickr and Vine Social icons. Before some days, we were published another template and that was, DreamLine - Responsive Personal Blogger Template. After that now we are publishing Fresh View Professional Blogger Template, its simple but awesome for any kind of personal blog. In this template we again use Features posts Slider with professional look. This template is perfect and compatible with any personal blog, Review blog. Free download this best blogger template for your blog. Fresh View has some awesome features, that make your blog look like professional and give a professional look. In this template we bring some awesome features, that make your blog really awesome. Now introduce with Fresh View's all awesome features. Featured posts slider is another best widget of Fresh View Blogger Template. This is widget make this template more attractive and more professional. This widget automatically show 3 featured posts from your blog. That are most visited by users, or most popular on your blog. Sometimes it will show from last posts. That's means, sometimes it will show from recent posts. SEO is most important part of template design. MS Design always focus on SEO Optimization when design a unique template. Fresh View isn't progressed beyond from SEO Optimization. This blogger theme is fully seo ready blogger template. Blogger SEO is most important in search results. If your running a blogspot site, then focus on your blogger seo and seo friendly blogger template. This template up to 100% SEO scored. See The below screenshot. And more features made this template more professional. If you running a personal blog with blogspot platform, then you should use this Fresh View Blogger Template. This is a perfect blogger template for any kind of personal blog. This template make your blog more professional and more attractive. Thank you v. much for this awesome template, but nav wrapper not responsive, search icon not show in mobile devices Can you help please! ?